13 acres at the Intersection of Hwy 29 Bus (Freeway Drive) and Scales St with access from both roads. Site is sub-dividable! 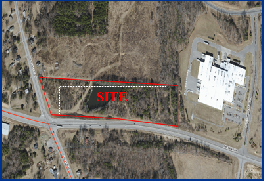 The property is less than 1 mile from Hwy 29 Bypass and located next to the Reidsville Industrial Park. The site would be great for Retail or Mixed-use development. Water and Sewer are available. NCDOT is putting in 5 lanes of Roads and infrastructure starting from Hwy 29 Bypass to Hwy 14. This is going to be a Major Artery for Reidsville and its growth. Just a few miles from the Reidsville Commons Shopping Center, New Sheets Gas Station, Taco Bell, Rite-Aid, New Free-Standing Verizon Wireless Store and other new National Brand retailers. The property can be combined with an additional 24 acre neighboring tract of land. help local businesses grow at a increasing rate. Freeway Drive connects to 29 Business in Reidsville followed by, "NC 14, NC 87, and US 158" (Edwards, Walston, Marshall, Norwood, Toney 2001). Due to the amount of increasing traffic flow this project could bring roughly between "10,000 vpd and 15,000" more based by future developmental growth in Reidsville, NC (Edwards, Walston, Marshall, Norwood, Toney 2001).